News | Critics love THE PLAYWRIGHT and AX: ALTERNATIVE MANGA! A couple new rave reviews have just come in, of outstanding new books that will be moving like hotcakes at next week's San Diego Comic-Con! First, Chad Nevett at Comic Book Resources has a nice review of Eddie Campbell & Daren White's dark romantic comedy The Playwright. "There’s a great emotional impact as the book progresses, underscored by Campbell’s art. The Playwright is a touching and masterful work that is definitely one of the ‘must own’ graphic novels of 2010." We agree 100%! 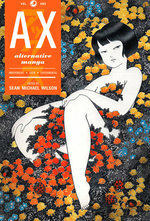 Also, this week's Publishers Weekly has a coveted *starred review* praising Ax: A Collection of Alternative Manga edited by Sean Michael Wilson. "Within the pages of this greatly anticipated manga anthology are some of the most imaginative, lush, grotesque, and ridiculous comics to come out of Japan... It's an incredible selection." Connie at PopCultureShock agrees: "There’s a little bit for every taste here, and as a look at Japanese underground comics, it’s the best we’ve had in English... it’s fascinating to browse the myriad styles that come forward when editorial restraints are cut." 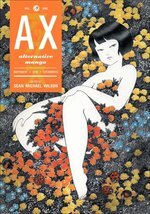 Her conclusion: Ax is "by far one of the best manga anthologies we’ve seen in English, and is up there with the best comic anthologies I’ve seen, period."